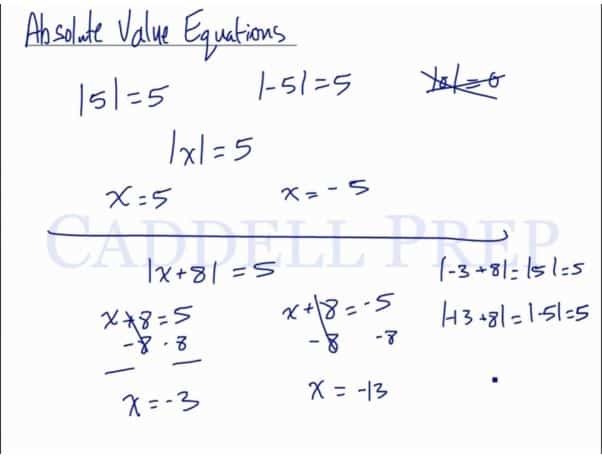 In this video, we will be learning how to solve absolute value equations. Let’s go over absolute value equations. The absolute value is the distance of a number from . The absolute value is the positive of that number. No matter what number we put in the absolute value, the answer is always positive. Even if it’s zero. Zero is neither positive nor negative. If , we can have two values for . Here, we can have two values of . First, let’s solve the left equation. Let’s go to the other equation. If we substitute these two values into , we’ll know they are both true. So we already proved that both answers are correct. Before we get our two equations, we have to get the absolute value by itself. Now, let’s get rid of by subtracting it on both sides. From here, we have two equations. Let’s solve both of the equations individually. Another keypoint is there are some equations that has no solution. Here, it’s impossible to get the value of to end up with a negative answer. Because the absolute value of anything is always positive or zero. In order to solve this, we have to have by itself. Let’s solve now by subtracting on both sides. Now, let’s get the two equations.